Workbenches come in all shapes and sizes. Some of them fold, some are built in place and are designed to never move, and some are on wheels. 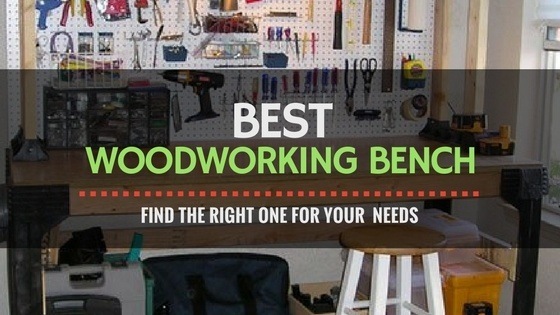 Each user has to determine the best woodworking bench for their particular needs. If you're going for a permanent placement, remember to measure twice! If you're lucky enough to have a dedicated woodshop, a bigger bench is probably better. 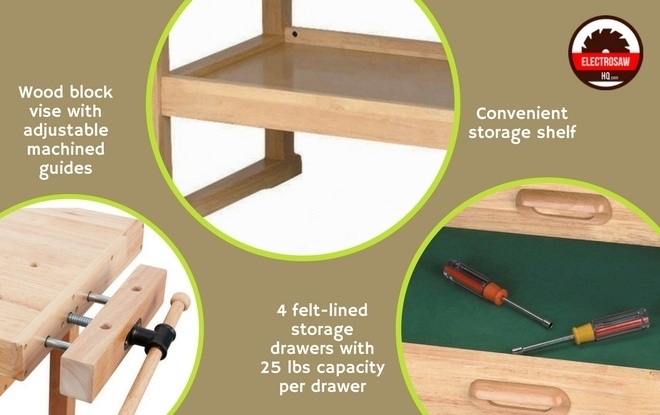 Investing in a workbench with durable drawers will save a lot of fixing and fiddling later with drawers that don't open because they're sagging under the weight of your tools. You might also consider a permanent bench installation to maximize your workspace. For those who need to move their car to work on carpentry projects, a rolling bench is best. Take special care to invest in something with high-quality castors. Garage floors are not always level and it can be difficult to move a rolling workbench over cracks. If you're going to be using different table saws on your workbench, make sure to get heavy castors with solid brakes and anti-skid systems. Finally, if your workshop is also your living room, a folding bench is a great tool to have on standby. 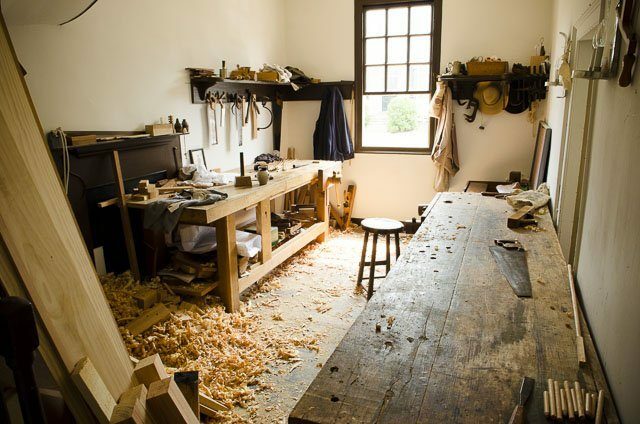 Each craftsperson needs to assess their space and their needs, and choose accordingly. As a general rule, the workbench height standard dimensions are about the same as a​ kitchen counter; 36" for a kitchen counter comes from a 34.5" stock cabinet height topped with a standard countertop. It's also important to consider the depth of your workbench. 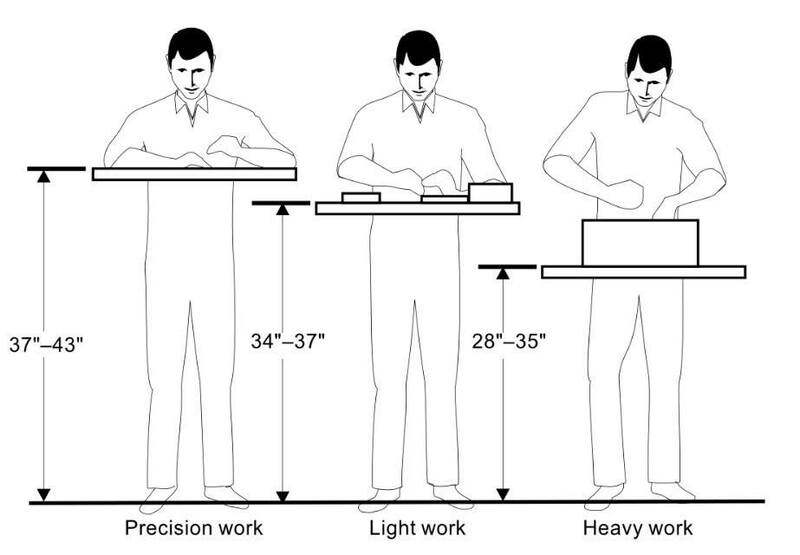 The Hopkins construction system listed below will let you build a workbench based on a 4' by 8' sheet of particleboard. However, that is a lot of real estate to use up in your garage and will require a long reach to work across. Consider laying out the workbench dimensions on your garage floor to make sure that your intended workbench height ergonomics will work for all users. If you're not of an average height, don't worry about standard workbench dimensions. You'll be safer and happier working at a comfortable height. Customize as much as possible. For shorter carpenters, consider investing in a rolling workbench with removable castors; once the wheels are gone, your workbench may be the perfect height. If you're taller than average, look into adding another layer of decking to your workbench to build up the countertop to a more comfortable height. While clamps and dowels are often part of a traditional woodworking bench, be sure that the unit that you buy features the customization you'll need. Planning on using cordless tools? Get a bench with a spot for your chargers. Do you like to use air power tools? Check the dimensions to see if your compressor will fit underneath. Some users prefer drawers; others find that tools roll to the back and get lost. If you like your tools visible, set your workbench up under a quality pegboard. If that's your plan, review your garage workbench dimensions to make certain that the unit is shallow enough for you to reach your tools. If you've got a stock of woodworking tools, be sure to allow space for shelving, or get a workbench with built in shelving underneath. It's frustrating to find your workbench so covered in tools that you can't actually work on it. Your ideal workbench dimensions need to allow space both for tools and for you to actually lay things out and study your patterns and designs. 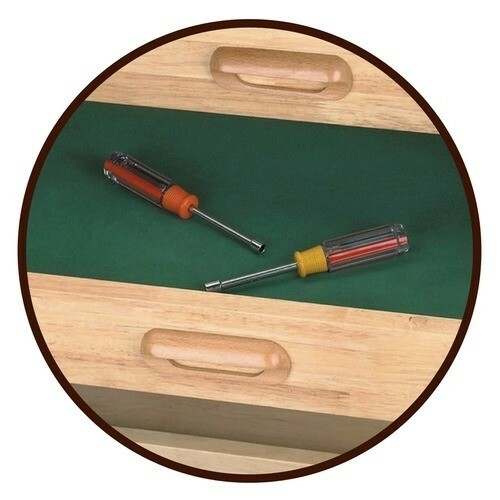 This video demonstrates rolling tables with flip tops for easy access to stored tools. These benches are constructed of durable 2 by 4s and feature heavy duty castors. No matter what you do to your workbench, whether you buy new or build your own, always remember to invest in large, heavy castors! 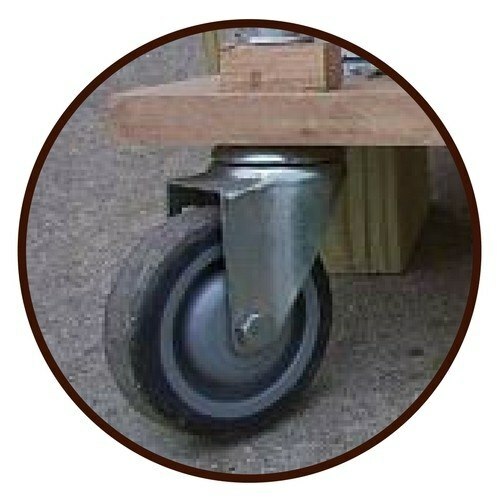 Small wheels have small bearings and will not hold up over time. Additionally, if you have to force your workbench to roll, you may flip it. If you've got a wood shop or dedicated workspace for your woodworking tools, the Windsor is an ideal bench. It has four drawers for hand tools and a storage shelf along the bottom for larger tool kits or bigger electric tools. The woodworking bench dimensions for this unit are a little smaller than usual. The working deck is 20 inches deep by 60 inches long. There are dowels that can be used to brace a project as you sand or chisel; anyone who's ever tried to use a belt sander only to watch the project go sliding off the table as the sander was applied will appreciate these dowels! Additionally, there's a vise at the end of the table for any projects you need to stand on edge. You'll want some help around when this workbench arrives; the shipping weight is 113 pounds. However, once you get it assembled it will handle 250 pounds. The Whalen workbench is a great fit for anyone who's taller than average or who needs a higher working surface. Once the castors are attached, this workbench is 37" high. 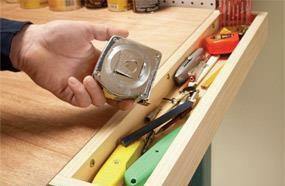 There are three heavy duty drawers for tools and a bottom shelf for additional storage of larger items. This is an extremely heavy product. Many users report placing it inside their homes to use as a kitchen island or sideboard. The castors lock, so you can easily move this workbench if needed. The top is made of Rubberwood, which has a walnut tone and scratches easily. If you plan to use this as a wood workbench. it may be a good idea to invest in a piece of plexiglass or particle board to protect the top, especially if you eventually want to use it in another spot in your home. Shipping weight is 210 pounds. Get a buddy! If you're looking for an extra spot to store a mitre or tile say, check out this hearty folding workbench. The WM125 is less than 15 pounds but will tolerate 350 pounds in weight. When closed, this tool is 36" tall, 24" wide and only 5" deep. If you're trying to work on projects in an apartment or small home, this tool will not burn a lot of your storage space. However, the weight tolerance will come in handy! Once open, the deck is 24" wide and 13.5" deep. It's also almost 30" tall, so you can stand and use this table easily. The two slats on the top also function as a clamp for anything you need to hold on edge. When you buy this product, be aware that you are only getting the corner bracings and shelf brackets; you will still need to purchase lumber and particleboard for the decking. 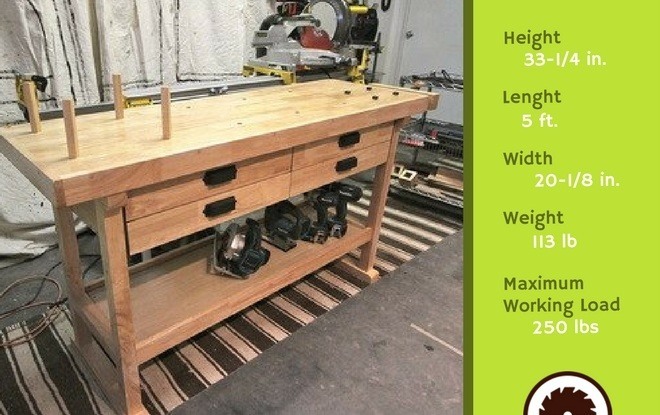 However, if you've got an odd spot and really need some extra storage, this is a great system to purchase for building a simple, custom workbench. The Hopkins 90164 kit is made of a durable, rigid plastic. Once assembled, these shelves are rated to support 1000 pounds per shelf. This would be a great kit for anyone interested in metalworking tools or automotive work. If you are shorter than average, you may need a working platform to access the entire deck of this bench when fully assembled; the deck will be 36" high. There's not a lot of flexibility in the deck height, but the shelves in back offer more flexibility. Customizable corner brackets; built to suit your space. The GAWB66BAWG features a heavy-duty bamboo top and durable metal legs with levelers to compensate for any variations in the floor of your workspace. Once assembled, this bench will be quite tall; nearly 38 inches. The span of the metal legs is large enough for rolling tool carts to fit underneath; measure carefully to make sure everything will fit. Anyone with an interest in environmental sustainability will greatly appreciate this bench. Bamboo products are easily replenished, look terrific and will last for years. The delivery weight of this package is less than 85 pounds. The assembly of the metal legs is quite simple. Be prepared to enlist some help when placing the top on the frame; it's really the heaviest part of the bench. A great permanent workbench will give you somewhere to store things and plenty of working space. If at all possible, a bench with castors is a great investment simply for the flexibility. However, if your space is especially small or if you need to address carpentry issues inside your home, a folding bench is best. 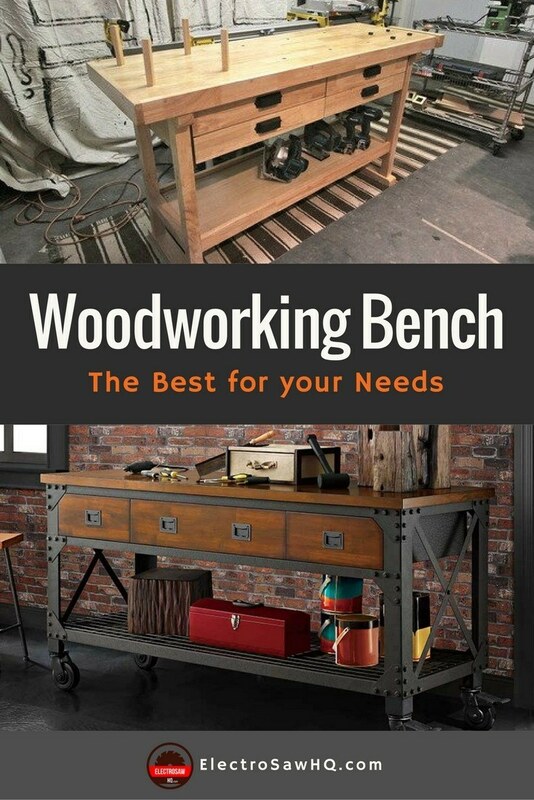 There are many types of woodworking benches available, and each need is different. Be sure to measure your space at least twice before investing in a bench, and carefully review working heights to make your woodworking projects fun and as comfortable as possible.